As seen in the Products section of the June issue of Foodservice Equipment & Supplies Magazine, FWE‘s Mobile Heated Banquet Carts are at the heart of every banquet operation. 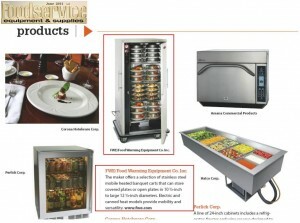 FWE offers the greatest number of choices and the largest selection of capacities in the industry. Heavy duty stainless steel construction is standard. Choose from covered plates or open plates – 10 ½” to large 12 ½” diameters. Electric and canned heat models provide the ultimate in mobility and versatility.